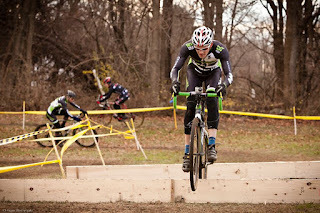 I have never been so pleasantly surprised by a race course in my life as I was at NBX Day 1. I prerode, and it was basically the fastest, easiest cross course in the history of bikes. As someone who needs accelerations and technical sections to be respectable in the elite race, this sent me into immediate WHINE MODE. It also sent me into find-a-file-tread mode, because if there aren't any damn corners on the course then I have no intention of having any traction. So in between whining about how it was a stupid power course and I was going to get crushed and this is lame, bike racing shouldn't have that much pedaling... I got some file treads from Matt Myette. Which was cool. Then I spent the rest of my warmup complaining about the course anyway. Just to open the lungs, dontcha know.